On Christmas Eve twenty years earlier, Marlee and Jacob were married in a snowstorm. This Christmas Eve, they are ready to quit, divorce is imminent. Their relationship is as icy as the road they’re traveling and as blocked with troubles as the piling snow. They take a shortcut to get to the lawyer’s office, on a slippery, no-fault path. She thinks they need to stay on the main road. He disagrees. They fight. Story of their lives and they slam into a bank of snow , spinning, drifting, falling, out of control. Just like their lives. Reluctantly, freezing cold, hungry, scared, she trudges up the hill. Paul is nowhere to be found. Her ears frozen, fingers and hands red, she comes to a house on the hillside, built like a Bed and Breakfast, a green wreath on the red door and the door-knocker is in the shape of a wedding ring. The red door opens and the first thing she notices is the fire in the room, blazing hot, a warm, inviting, friendly place and the voice of an old man welcomes her in. There are three golden pots on the hearth, shining, glimmering things. The old man claims that they are used to restore marriages. She laughs—and begins a journey through her past, present, and future that will test how she views her lifelong love. There are two futures available. Which will she choose? Marlee and Jacob Ebenezer. I love it already! Marlee and Jacob are on their way on their twentieth wedding anniversary to sign the papers that will end their marriage when a car "accident" sends them careening off the road. And where oh where do they end up? When Marlee comes to, Jacob is no where to be seen. She starts off on a journey to find Jacob and comes across a cabin where she meets Jay and his wife. Now, this is no ordinary couple. You saw that coming, right?! It seems Jay is the "ghost" that will take Marlee on her visits to the past, the present and the future by using a great plot device...magic snowfall!! And like the Dickens' inspiration, this snowfall allows Marlee to see things in a different light, how our decisions in life affect our present and our future. In some ways, I also was reminded of the spirit of "It's A Wonderful Life" in that we can make or break our own world and the world of the others around us. 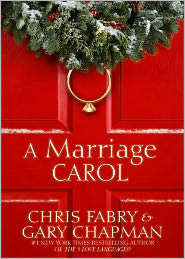 Authors Chris Fabry and Gary Chapman have woven a magical tale in A Marriage Carol, one that shows us that we can do great harm in our relationships with others and that we do have a "cause and effect" system in our lives, both for the good and the not-so-good. It shows us that in this cynical world, where we throw relationships away when they get difficult, that marriages are for ever, for better and for worse, and that God brings life into the marriage. Brilliantly written, this little book (under 130 pages) has more warmth and heart than others twice is length. I just can't tell you how much I enjoyed this magical story. A copy of A Marriage Carol will find its way under the Christmas trees and into the stockings of a lot of my friends this Christmas, and I think it will become my new favorite gift for friends about to be married. This e-galley was provided to me at my request, by the publishers through NetGalley.